Money maths practise sharpens minds and fattens wallets. Education.com offers a mix of money maths tools to hone this useful skill. 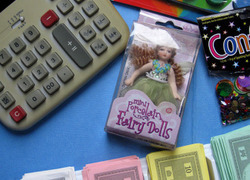 Whether preschoolers are familiarizing themselves with what money looks like or if fifth graders are dividing with decimals, there are resources in the Learning Library to transform practical money practise into future financial prowess. This is a simple counting worksheet, focusing on addition and subtraction for preschoolers. Use this colorful two-digit addition worksheet with your child. 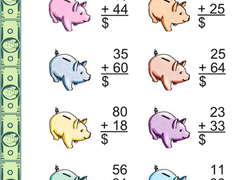 Solve this addition problems to find out how much money is in each piggy bank. A counting worksheet for preschoolers featuring a toy rocking horse. Here's a great worksheet for practising the money maths that your 1st grader will be taught at school. Buy all the ice cream without leaving any unused coins. Use this colorful worksheet to boost your second grader's maths skills. She'll add up all the problems to see how much money is in each piggy bank. Introduce your child to the concept of value with this comparison worksheet that asks her to look at each pair of objects, then circle the one that costs more. Use these vocabulary cards with the EL Support Lesson Plan: Purchasing Items and Making Change. Work on two-digit addition with this piggy bank maths worksheet. Kids will solve problems to find out how much money is in each bank. Our maths worksheet will give your kid practise with money amounts, and translating written numbers from words into numerals. He'll read dollar values too. Teach your child how to write money amounts with this worksheet, where he’ll practise translating written numbers from words into numerical digits. The safest way to double your money is to fold it once and put it in your pocket! Teach your child how to write money amounts with this worksheet. This piggy-bank-themed worksheet will help your little mathematician practise two-digit addition. Try this addition worksheet with your child. Can your child help get the coins back in their correct spot? He'll have to sort out the different coins and identify their values. This maths worksheet will give your child great practise with money amounts, and translating written numbers from words into numerical digits. Kids will do two-digit addition problems to find out how much money is in each piggy bank in this worksheet. practise maths skills with this worksheet. Try this piggy-bank-themed worksheet to practise addition with your child. Solve addition problems to find out how much money is in each piggy bank. Solve two-digit addition problems in this piggy-bank-themed worksheet. Use your maths skills to figure out how much money is in each piggy bank. This cheerful worksheet gives your second grader the practise she needs to master addition! 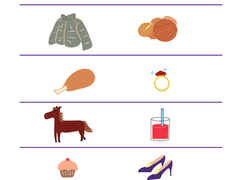 How much money does each little piggy have? Give your second grader's double-digit addition skills a work out with this fun printable. Try this piggy-bank-themed addition worksheet with your child. Your child will figure out how much money is in each piggy while practising adding double digits. Use this scaffolded EL lesson to teach students about money and the bills we use to pay for things. Use alongside Base Ten Money: Hundreds, Tens, and Ones or alone as an independent lesson. 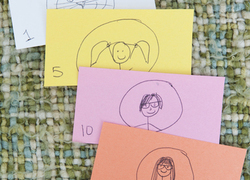 Design and Create Your Own Family "Money"
With this fun craft activity, your child can design and "make" his own money, for use as currency and maths practise at home. This activity will not only teach your child important maths concepts regarding money and value, but also how to hunt for bargains! This 100th Day of School, have some fun with your first or second grader, looking for creative ways that 100 cents can make $1.00! Money is used on a daily basis, so it's essential for children to know how to use it responsibly. That is why the Learning Library supplies teachers, parents and tutors with a generous supply of money maths resources for preschoolers and up. The hundreds of printable worksheets range from lessons on basic money terms to word challenges. Some assignments take students ""shopping"" at coffee shops or a sports store to learn practical money word problems. Young students learn how to count money and how cents translates to dollars. A variety of coloring worksheets familiarize small students with how money looks. For interactive lessons, the resource library possesses multiple online games where kids can sort money or learn decimal division with pennies. There is an assortment of hands-on activities and games that utilize real money for practise. 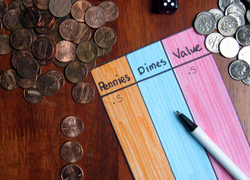 Kids can compete to count to a dollar first with a racing game or build their own construction paper piggy bank. 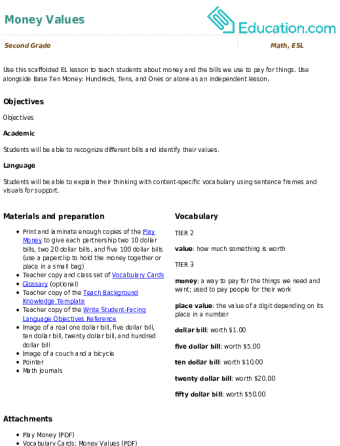 There are many step-by-step guides that are created by professional educators. Popular lessons such as Money maths, Show Me the MoneyAnd Add It Up! Counting MoneyMake teaching streamlined, yet entertaining. An abundance of other guided lessons, interactive books and more are easy to access from the Learning Library to teach students to be money masters.